Local politicians marked International Women's Day in a variety of ways, from students shadowing the local MP to asking women on the high street what local issues are important to them. 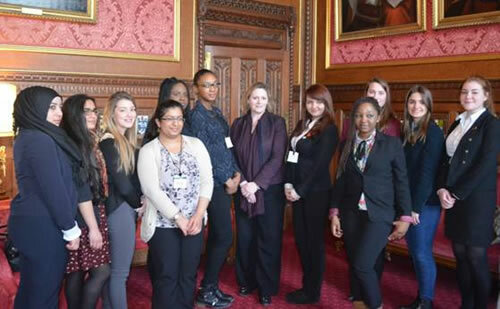 The MP for Brentford and Isleworth, Mary Macleod invited young women from the local area to shadow her in the House of Commons for the day. The theme for the day was ‘Inspiring Change’ and students from Heathland, Gunnersbury Catholic, Brentford School for Girls, Gumley House Convent School, West Thames College and Kingsley Academy participated. Over 100 students from around the UK took part in the programme organised by Mary in her role as Chairman of the All Party Parliamentary Group for Women in Parliament. The day was designed to inspire the next generation to consider careers they might not have thought about initially, such as politics, banking and the armed forces. The students attended a number of events to mark the day, such as a tour of Parliament and a chance to listen in on the various debates taking place in both the Commons and the Lords. Mary said:, “I was impressed by the political awareness, maturity and confidence shown by the young women from my constituency. They suggested some very creative and innovative ideas on how to improve their local area and I hope we can work together to implement some of these in the future. It is important that we continue to work to increase the representation of women in Parliament and I hope that in a few years some of these young women will return as MPs”. Seema Malhotra, MP for Feltham & Heston and Cllr Ruth Cadbury, took to Hounslow High Street on Saturday to ask local women what issues are important to them. 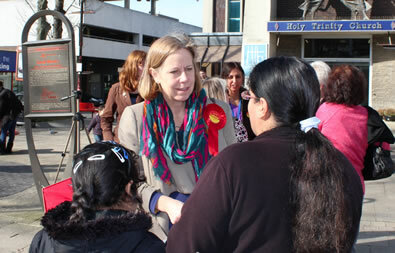 They were joined by female Council candidates and local Labour Party activists. Ms Malhotra said; “We heard from many local women who are going through a tough time right now. The number of women in Hounslow who are out of work has rocketed under this Government with the local female unemployment rate nearly doubling from 5% to 9.5% in just two and a half years.